I was born in India, and grew up in England and Ireland. In the 1990's I inherited the war diaries of Captain Charlie May, who was my great-uncle. While the original diaries were deposited in the archives of the Manchester Regiment, the transcripts of these diaries are now in the Imperial War Museum. They are not simply accounts of mud and blood on the Western Front, but were an uncensored opportunity for Charlie to express his view of the world and the people around him. I am very fortunate that Andrew was able to place his diaries with Harper Collins. After an undistinguished education and misspent youth, to fulfill a passion I became an actor. This led me to see that life behind a camera was far more fun and certainly more lucrative than in front, and far more preferable to the uncertainties of the theatre. After a spell at BBC-TV, I followed a rewarding career on the production side of feature films, culminating in 'Monty Python and the Holy Grail'. By the mid-1970s I was producing and directing in television for programmes like the 'South Bank Show' and dramas like 'Casualty'. As a producer, I had to develop proposals to pitch to insecure commissioning editors, so I seriously began to research and write. Outlines and treatments poured out. Some were extended into full screenplays. Writing became a pleasure – I am never short of words, just time - and to earn a few bob this writing extended into freelance journalism, first with the local paper. Politics then grabbed me, and I was elected in 1994 to a local authority. The remuneration was tiny, so my freelance writing and journalism increased. I have now written pieces for the Guardian and the London Times, and now write occasional book reviews for the Irish Times. It was my enjoyment of the written word, my reading of history and the rediscovery of my own Irishness, which led me to write The Scattering, a history of post-war Irish emigration to north London. This was published in 2004. A second, revised, edition is constantly requested. 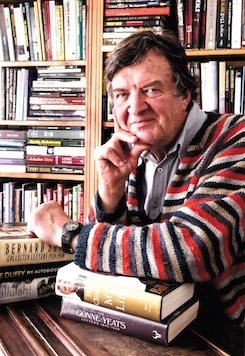 I am currently completing a biography of Reggie Smith, the 'legendary' BBC radio producer and communist, who was the husband of the novelist Olivia Manning. My wife and I now live in the wild west of Ireland with our lurcher and two charming donkeys. I write here and when I can I try to play the tenor saxophone. To Fight Alongside Friends: The First World War Diaries Of Charlie May was serialised in the Express at the weekend. 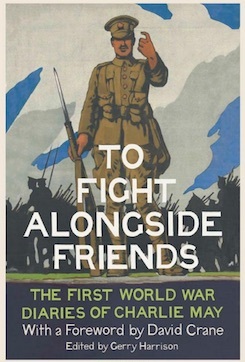 The Times has serialised two pieces from Gerry Harrison’s edition of his great-uncle’s diaries, To Fight Alongside Friends: The First World War Diaries of Charlie May, which is published today.